One of our absolute favorite fall activities is apple picking! As usual we went to one of our favorite orchards for a day that included apple cider donuts, pictures with pumpkins, a hayride, and plenty of apples that have since turned into after-school snacks and apple pies! yum! Getting to work filling our bags! Family photo surround by fall beauty! Not to be outdone by big sister, J started preschool today at Highrock Covenent Preschool! Lots of encouragement from big sister S! Today was the first day of second grade for S. She was quite excited and appears eager to learn! The only day she'll want to run to school! 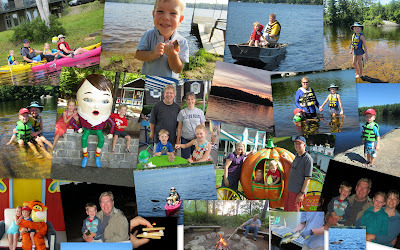 Family vaction in Maine - lakes, fishing, boating, kayaking, bon fires, smores, swimming and Storyland! Fun, fun, fun!!! No wonder they call Maine - Vacationland. The second part of the summer vacation was visiting North Carolina. The first stop was Winston-Salem in order for me to visit my Alma Mater, Salem College. We all enjoyed having a tour of the campus and seeing the upgrades and then taking a tour of historical Old Salem. Dinner that evening was spent with 3 college friends of mine! The next morning we drove off to Holden Beach where we then spent the next 8 days. The weather was perfect for swimming every day, going to the beach, collecting shells, and doing some crafting. 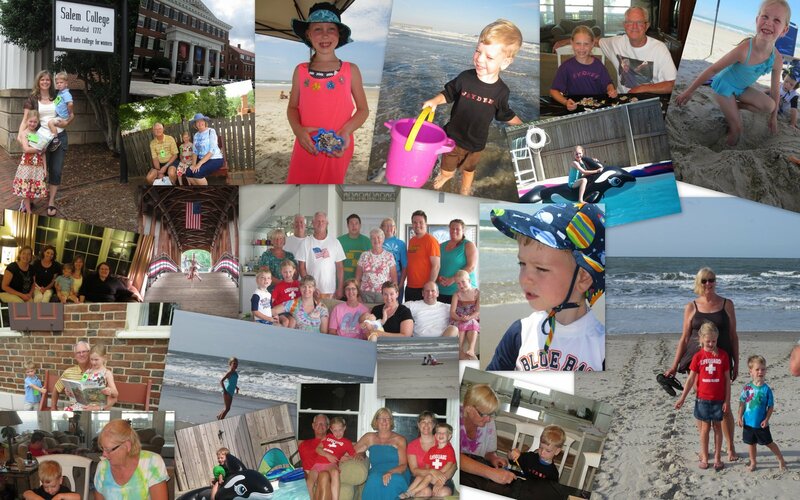 The lower right picture is showing some sea turtle tracks that we found on our last day at the beach! It was a great time with family that we don't see too often and friends (old ones and new ones) and enjoying the beautiful North Carolina coast! Here it is, the first day of school and I realize that the last blog post was on the last one! 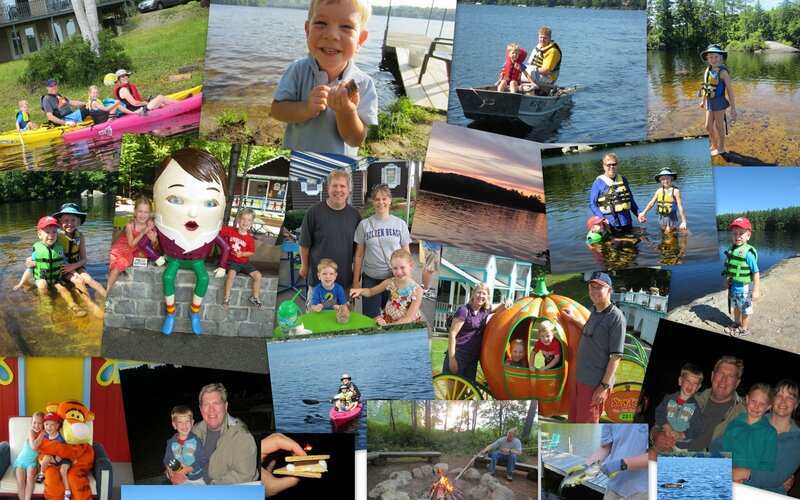 It was a busy summer for the family and would take ages to upload all the important happenings. 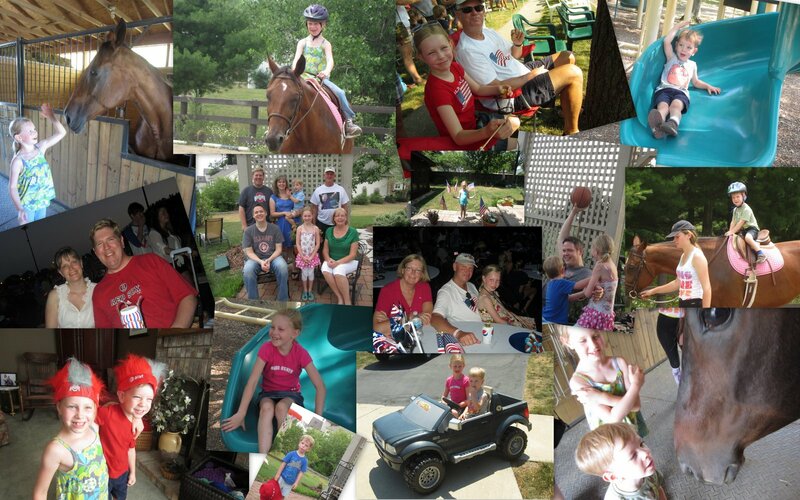 So, collages it is! This one highlights our vacation, part 1, in Ohio. We got to spend time riding horses, playing around Grandma and Grandpa's neighborhood, going to the 4th of July parade and fireworks, and just being silly (yes, in those crazy Ohio State fuzzy-hair hats!) It was so fun to be able to spend so much time with Grandma, Grandpa, and Uncle Jeff. It was extremely hot while in Ohio, but we didn't let that stop us from enjoying our visit with family.